“Autism Awareness Month”: Call the Autism Society of Canada 1-866-478-8440 or see www.autismsocietycanada.ca. “Brain Tumour Awareness Month”: The Brain Tumour Foundation of Canada’s website is www.braintumour.ca. “Canadian Library Month”: For info, contact the Canadian Library Association at 613-232-9625 or see www.cla.ca. “Car Safety Month”: See the Automotive Industries Association of Canada website at www.aiacanada.com. “Child Abuse Awareness Month”: see www.redcross.ca. “Breast Cancer Awareness Month”: For info, call the Canadian Breast Cancer Foundation 1-800-387-9810 or see www.cbcf.org. “Global Diversity Awareness Month”: Celebrating, promoting and appreciating the global diversity of our society. Call Carole Copeland Thomas 508-947-5755, email TellCarole@mac.com. “Intergeneration Month”: Connecting generations through communication, celebration and education. Annually, the first Sunday in October, starting Intergeneration Week. Call the Intergeneration Foundation 719-649-7443, see www.intergenerationday.org. .
“Women’s History Month”: see www.swc-cfc.gc.ca/dates/whm-mhf/index.eng.html. Oct 1 “World Vegetarian Day”: Celebration of vegetarianism’s benefits to humans, animals and our planet. Call 518-568-7970 or email navs@telenet.net. See www.worldvegetarianday.org. Oct 2-8 “Carry a Tune Week”: Celebrates favourite tunes from the past by performing them in a concert, at school, at church or at home. Call 781-344-6954, email pinetreemusic@aol.com, web: www.americanmusicpreservation.com/announcements.htm. Oct 3 “World Habitat Day”: see www.un.org. Oct 4 “Ten-Four Day”: The fourth day of the tenth month is a day of recognition for radio operators, whose code words “Ten Four” signal an affirmative reply. Involve your local Ham radio club on your show, and see how far away they can transmit. If you get the right people, they are very interesting. Oct 4-10 “United Nations World Space Week”: To celebrate the contributions of space science and technology to the betterment of the human condition. See www.worldspaceweek.org. Oct 5 “International World Teachers’ Day”: A day to honour teachers and their contributions to learning. For info go to www.un.org. Oct 7 “World Smile Day”: A day dedicated to good works and good cheer. Do an act of kindness and help one person smile. See www.worldsmileday.com. Oct 7-15 “Oktoberfest” The second largest Oktoberfest in the world is held in Kitchener, Ontario. More than 700,000 people attend the 70 events over the week. Call the organizers for more info 519-570-4267, email info@oktoberfest.ca, or visit www.oktoberfest.ca. Oct 10 “Thanksgiving Day”: Observed in Canada on the second Monday in October each year. Oct 10-16 “Citizenship Week”: Canada’s Citizenship Week is intended to encourage all Canadians to reflect on the value of citizenship and what it means to be Canadian. See www.cic.gc.ca/english/celebrate/citweek.asp. Oct 12 “National Bring Your Teddy Bear To Work Day”: A celebration of the help, stress relief and joy that teddy bears bring into the lives of people of all ages and stages. Call Susan Schwartz 650-345-4944 or e-mail suwho@astound.net. Oct 12 “International Moment of Frustration Scream Day”: To share any or all of our frustrations, all citizens of the world will go outdoors at twelve hundred hours Greenwich time and scream for 30 seconds. We will all feel better or Earth will go off its orbit. Call 717-279-0184, email info@wellcat.com, or see www.wellcat.com. Oct 14 “Be Bald and Be Free Day”: For those who are bald and who either do wear or do not wear a wig or toupe, this is the day to go “shiny” and be proud. Call 717-279-0184 or see www.wellcat.com. Oct 15 “Grouch Day”: All grouches deserve a day to be recognized. Created for and inspired by Alan Miller, a retired teacher. Oct 16 “Dictionary Day”: The birthday of Noah Webster, American teacher and lexicographer, is occasion to encourage every person to acquire at least one dictionary – and to use it regularly. Oct 16 “World Food Day”: To increase awareness, understanding and informed action on hunger. For info call 202-653-2404 or see www.fao.org/getinvolved/worldfoodday/en. Oct 17 “National Boss Day”: For all employees to honour their bosses. Oct 17 “Mulligan Day”: A day for giving yourself another chance or a do-over. Oct 17-23 “Getting the World to Beat a Path to Your Door Week”: To focus attention on improving public relationships in order to create success for companies, products and individuals. Call Barbara Gaughen 805-968-8567, email bgaughenmu@aol.com, web: www.robertmuller.org. Oct 17-23 “National School Safety Week”: see www.https://canadiansafetycouncil.org. Oct 17-23 “Waste Reduction Week”: Canadian campaign to reduce waste. See www.wrwcanada.com. Oct 18 “Persons Day”: To commemorate the anniversary of the 1929 ruling that declared women to be persons in Canada. Oct 22 “International Stuttering Awareness Day”: For info call National Stuttering Assn. 1-800-992-9392. see www.westutter.org. Oct 22 “Make A Difference Day”: A national day of community service. For information call 800-416-3824 or visit www.makeadifferenceday.com. Oct 23 “Mother-in-law Day”: Traditionally the 4th Sunday in October is the occasion to honour mothers-in-law for their contribution to the success of families and for their good humour in enduring bad jokes. Oct 25-31 “International Magic Week”: A week to celebrate the world of magic and the magicians who create it. Call Sir Nemo Turner 514-849-0888, email magician@total.net. Oct 30 “Devil’s Night”: A night of mischief and harmless pranks on the evening before Halloween carried out mainly by children. Oct 31 “Halloween”: A druid autumn festival dating from the 6th century, has long been associated with thoughts of the dead, spirits, witches, ghosts and devils. Craig Timmermans runs two radio stations in Little Current on Manitoulin Island, Ontario. He is using a small wind turbine at his Transmitter Site and a bio-diesel generator at the studio’s to lower his hydro bill. He talks with Steve Paikin from TVO about how to run a radio station on green energy for next to nothing. Craig plans to install more wind turbines at the Transmitter site by the end of this year to reduce his hydo bill even further and perhaps even sell power to the grid. It was a real honour to be asked to deliver the Key Note address at the Central Canada Broadcast Engineers (C.C.B.E.) conference at the beautiful King bridge Centre just North of Toronto last week (16 September, 2017). I talked about how important Broadcast Technicians and Engineers are to our industry, how the business is performing, as well as some of the opportunities and concerns moving forward. Using the financial summary data for broadcasting from the C.R.T.C. website it is clear that radio is still a very profitable business to be in today. In 2015 there were 477 FM stations in Canada and they averaged a P.B.I.T. (profit before interest and tax) of 23.1% or $503,709 per station. If fact radio still offers better returns that many other industries. Clearly, the big markets are where all the big profits are being made, and those operators who are able to consolidate and use scale to their advantage are doing better than the average. I have no way to determining the real profit per station as the data is not broken down to that level. So the column on the far right is an average per station. Some stations will be doing better than the average and others will be not doing so well, but you get the idea. However, radio stations are fighting over a mere 12% of the advertising pie. TV gets 27%, newspaper 20%, and digital a whopping 33% based on the most recent figures. Radio should be going after more of the revenue spent on other media to grow top line profit and focus less on trying to lower costs to make the profit look good, as a lack of investment in the product, staff training and equipment will come back to haunt us all in the future. Radio us still consumed by over 93% of Canadians who spend about 19.3 hours a week listening to the radio, which is more time than they spend with any other medium. In fact, Canadians spend more time listening to radio than their American cousins, but less time reading newspapers & magazines. By the way, newspaper readership in Canada is down 25% over the past 8 years and 73% of Canadians say they never read the newspaper ads in their daily newspaper. TV viewership is also down, and more and more Canadians are PVR’ing programs to watch later and avoiding the TV ads and endless station promos. So while Newspaper and TV are less effective as a medium to reach consumers, Radio is performing at about the same level as it always has over the past 10 years. And by the way, Radio, according to the Music 360 Nielsen’s study of the tastes, habits, and preferences of music listeners, remains the top platform for music consumption. 59% of music listeners discover new music by listening to radio either over-the-air or online. And for all the publicity that Pandora has been getting in the press, it’s still behind a consumer’s music library at 48%, and on-demand streaming (Spotify, YouTube, or Vevo) at 41%. Curated streaming music such as Pandora or iTunes Radio sits at 36%, and most of these services have yet to make a profit. 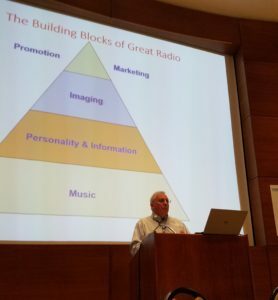 Radio needs to do a better job of selling the benefits of the medium, because all the other shiny new products are out there knocking radio and other traditional media. We need to continue to innovate and look for new ways to connect with our listeners, be on all the platforms they are on and figure out how to get the FM chip activated in all cell phones. CBC remain on top in Vancouver but lost some audience. The Cous News Talk station (CKNW) is up one spot to #2 and look to have picked up audience at the expense of the CBC. Slipping 1 spot to #3 is CHQM who has shed 36% of its audience in the past 3 books. The station on the move is Newcap’s LG104.3 (CHLG) who picked up 3 spots to make it to #6. Heading in the other direction is Country station JR -FM who slipped three palces to #9. Overall 5 station made gains, 5 slipped and 9 remained unchanged. Newcaps Boom 97.3 is on a roll and jumped 3 places to take the #1 in Toronto. CHFI slips to #2 for the first time in several books. It would appear the retirement of Mike Cooper and the changes made on that side of the desk has hurt CHFI. The CBC drop is down for the 3rd book in a row and comes in the #3. CHUM-FM remains at #4 and Bell will not be happy with the performance of Virgin 99.9 (CKFM) either as they slide another spot to #7. Overall 9 stations improved positions, 8 went down and 8 remained the same. No changes in the top 5 positions in Montreal. Bell’s CJAD keeps its hold on the #1 spot, but lost some audience this time around. Now they only control ¼ of all the tuning in the market! Cogeco’s Beat 92.5 (CKBE-FM) is static at #2 but picked up audience. At #3 is Bell’s Virgin Radio (CJFM-FM). Also stable at #4 is CHOM as is Cogeco’s Rhythm 105.7 (CFGL-FM) rounding out the top 5. Overall, 4 stations in this market increased their share while 5 slipped and 9 retained their previous ranks. 102.3 NOW! (CKNO-FM) is solid at #1 and picked up more audience in this last measurement period. Static is #2 is CISN-FM (Corus) who picked up more audience. The sister talk station to CISN is the Corus owned 630 CHED and they remain solid at #3. Next is Newcap’s Capital 96.3 (CKRA) who picked up a spot and audience to slide into #4. The Bear (CFBR-FM) are getting it back together and are up 3 spots to #5. The CBC had a rough book and dropped 4 places to #8. They have lost 50% of their audience share since December last year. Newcap’s AM country station (CFCW) are up one spot fo #6. The big mover this time around is 102.9 Sonic (CHDI-FM) who climbed 3 spots to #9. Overall, there were 5 stations improving market share, 5 stations in Calgary losing audience and 8 remaining static. An AM Talk station makes it to the top in Calgary for the first time in 2 years. Rogers News Talk 770 (CHRQ) is the #1 station in Calgary. Up a spot to #2 is the Corus Country station (CKRY), while slipping from first to third is Newcap’s XL 103 FM (CFXL-FM). The CBC are static in 4th place, while the top 5 is rounded out by Corus rocker Q107 (CFGQ) who are up two places from #7. At #6 it’s the Bell Media Rocker CJAY. X92.9 the Alternative station owned by Harvard Broadcasting slipped to #7. Overall, there were 7 stations improving market share,6 stations in Calgary losing audience and 5 remaining static.